We're going up in the world here at Front Door! What was once a teeny tiny little space where we could just about swing a cat (note: no animals were harmed in the course of our stay), is now a swanky, glass door-ed office with enough room not only to swing a cat but to catapult it. When we first launched Front Door, we came from humble beginnings. The very wonderful people at Tec Marina let us set up camp in their smallest office space, and with just two (which soon became three!) staff under our roof, we were sorted. Three tables, three chairs, and three million cups of tea were all we needed to make the magic happen. Happy as Larry in our cosy little room, and if we do say so ourselves, we used the space very well. Now, some may say that high heels and Nikes do not belong on the office floor, but we stand by the policy that in-case-of-emergency shoes (in a multitude of styles) must always be within reach. And never forget that a small office space means the trusty McCoys and Mr Kiplings are never too far out of sight. But fate came a ‘knocking, and when the opportunity to grab a brand-spanking new office opened up, we couldn’t resist. Our new abode has not three but five (yes that’s right!) desks, and a very fancy door which is as sleek and sophisticated as the team within. So, with our sights set on luxury we packed up shop and headed down to the new home of Front Door. And we love it! We’ve traded in cosy for capacious, and we’re still very smugly enjoying the ‘oohs’ and ‘aahs’ from everybody that pops in to visit. 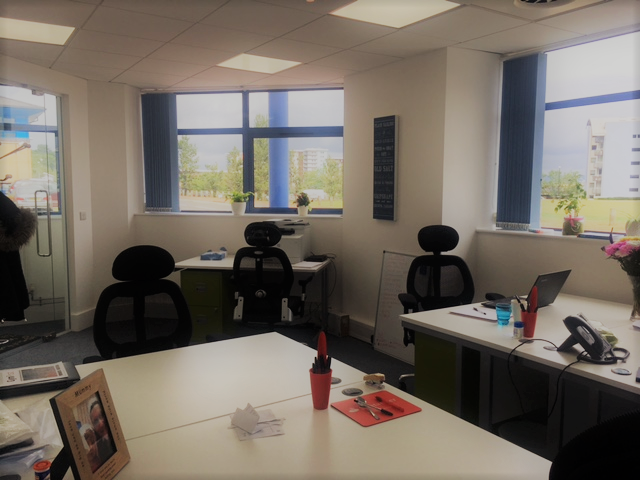 Although we’ve been only been here for two weeks, it already feels like home and we’re very much looking forward to basking in all this extra space for the next few months!